I love a film with style. If the plot or the acting isn’t up to scratch, at least you can enjoy feasting your eyes on the set and the costumes. 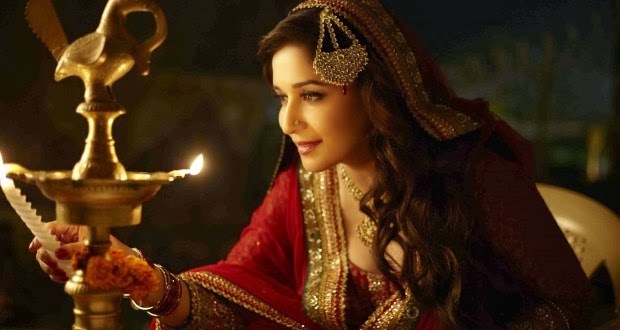 In films like Dedh Ishqiya, where the storyline and performances are superb, great styling is the icing on the cake. 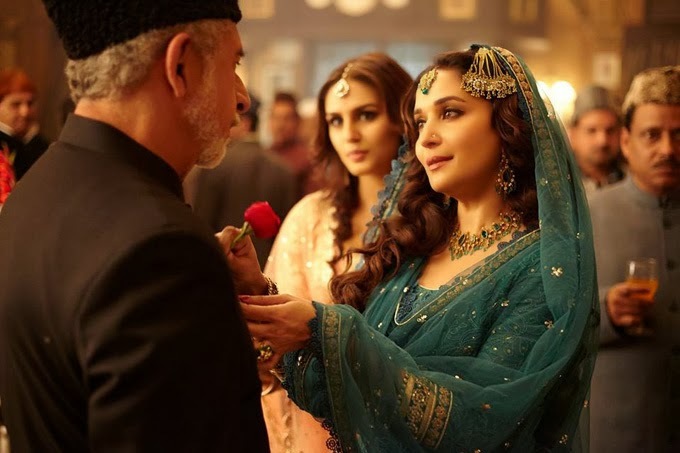 While Arshad Warsi and Huma Qureshi are suitably dressed their respective roles, it’s the Nawabi styling of Madhuri and Naseeruddin Shah that stands out in Dedh Ishqiya. Naseeruddin Shah’s sherwanis and qaraqul (Jinnah Cap) are a little too “Mohammed Ali Jinnah on a bank note” to appeal this side of the border, but his shawls and kurtas are enviable. Costume designer Payal Saluja has concentrated on timeless classics such as Lucknowi chikankari in developing the Nawabi theme. A few key elements bring together her sophisticated yet regal look. Ethereal and delicate, Chikankari has enduring charm that reeks of the subtlety of old money. Saluja has used Lucknowi chikankari in several of Madhuri’s outfits. The beige peshwaz that Madhuri dances in to Jagaave Sari Raina is an all-over chikankari, trimmed with rich jamawar. One of Madhuri’s most attractive outfits is a pale pink lucknowi sari with a simple gold edging. Lucknowi chikankari is particularly appealing in white and pastel shades and the sari shows the elegance of this embroidered fabric. 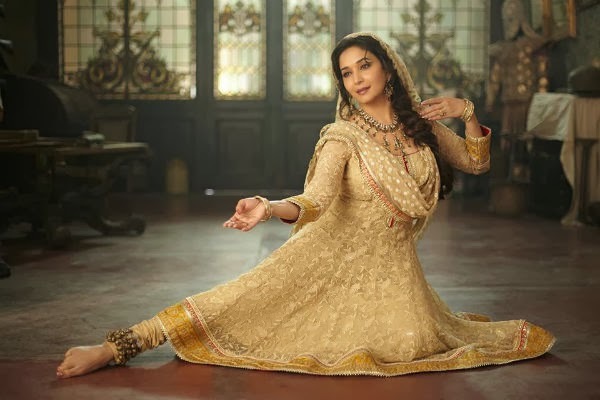 Madhuri also wears an exquisite black chikankari kameez with a banrsi lengha in the Hamari Atariya Pe song which plays at the end during the title credits. The delicate embroidery of the chikankari material adds a lush yet subtle textural aspect to the outfit. 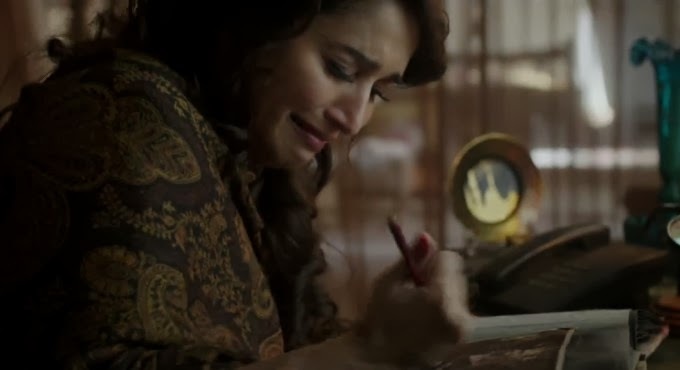 The shawls in Dedh Ishqiya are simply gorgeous. The sheer variety of luxurious shawls is fascinating – the actors carry Jamavar, Kalamkari and Kashmiri embroidered shawls. 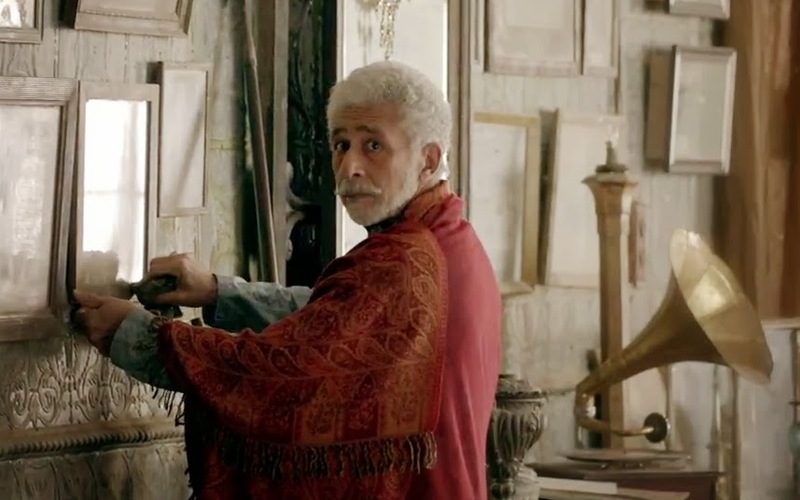 Naseeruddin Shah’s Khaalu is dressed mainly in Sherwanis and beautiful chikankari kurtas that are paired with some wonderful shawls. These blurry screenshots don’t do justice to a beautiful shawl. The Kalamkari shawl he wears when meets Madhuri’s Begum Para on the roof is an exceptional piece. The muted colours of the shawls worn by Khaalu and Begum Para add a sense of antiquity that enhances the atmosphere of the film. 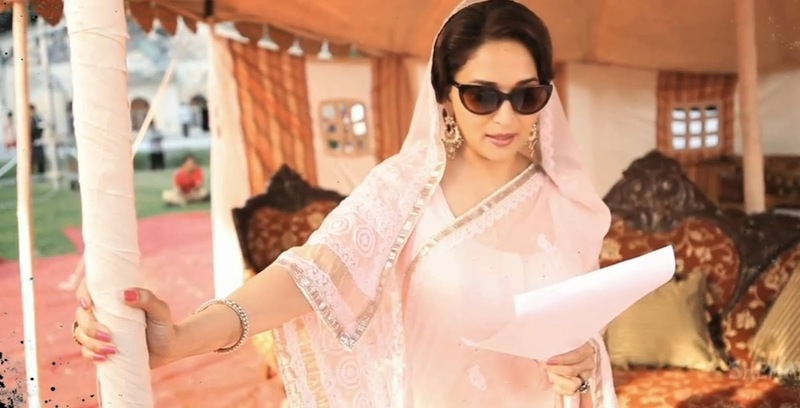 Madhuri carries a dupatta on her head pretty much in every scene. The look is consistent with the idea of a Begum from a certain era but what stands out is the elegance of the draping. The sheer delicate dupattas are arranged in the same way for every outfit, with a deep V at the neckline and enough fabric to gracefully frame Madhuri’s face. The look is an elegant option for brides, particularly as a poorly draped dupatta can ruin a bridal ensemble. Brides wanting to channel this look should bear in mind that it works best with a sheer dupatta and that the traditional one-shouldered drape will work better for heavier dupattas. Madhuri’s “wedding” outfit conforms to the mix and match trend with a red dupatta, green shirt and off white lengha but most of her outfits are resolutely in a single vibrant colour. She first appears in a stunning emerald green jora accented with gold embroidery and trimmings. Whether she is in a peshwaz, gharara, lengha or sari, Begum Para is almost always dressed in a single colour. That colour may be accented with contrasting trimmings or embroidery but Begum Para’s styling is a reminder of how effective and elegant monochrome can be. The tikka has been having a fashion moment recently. The tikka isn’t just for brides anymore – it’s been seen on everyone from teenagers to aunties – adding a formal yet trendy look to wedding ensembles. The jhoomar, on the other hand, is such a traditional piece that even many brides have balked at it. 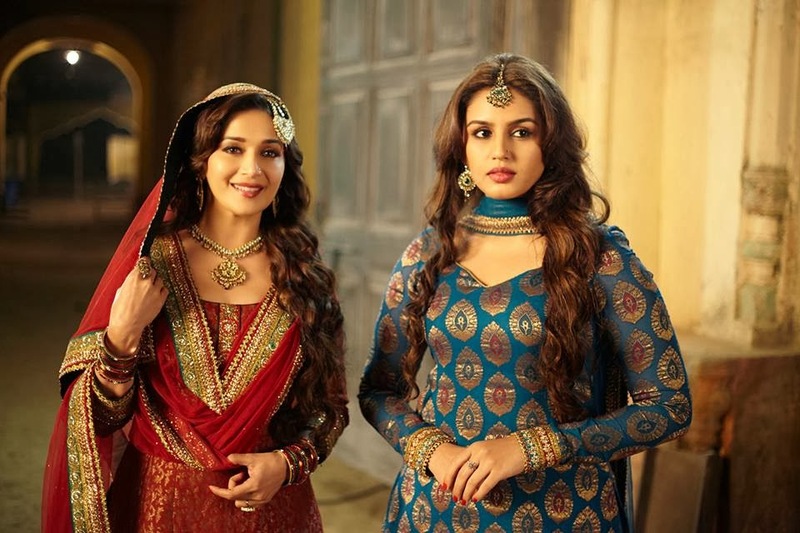 Costume designer Saluja describes the jhoomar as the trademark of a Begum and Madhuri wears one almost throughout the film. 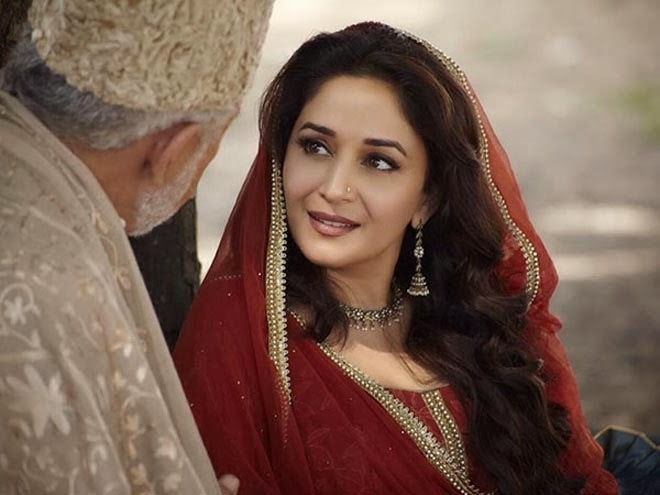 Madhuri’s look in Dedh Ishqiya shows that a delicate, correctly worn jhoomar can add a regal look without overwhelming a woman’s features. It’s lovely to see an actress in traditional cuts for the majority of a movie instead of simply in a wedding scene. Obviously this only works because this is a period piece where Madhuri plays a Begum Nawab. 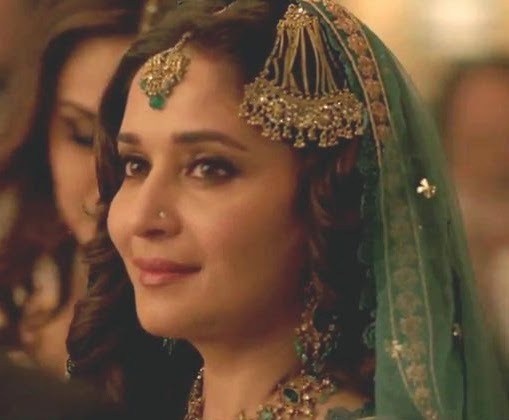 Still the peshwazes, ghararas and lenghas lend Madhuri’s character a certain grace that’s a pleasure to watch. Madhuri’s hair and makeup is also worth mentioning. The tumbling curls and natural, flawless makeup enhance Madhuri’s beauty and give a youthful spin to costumes that could have been very ageing. Dedh Ishqiya is one of the rare movies that deserve a second look simply for the beauty of its costumes. Payal Saluja apparently spent months on the details, scouring lanes in Delhi and Lucknow for just the right materials and jewellery. 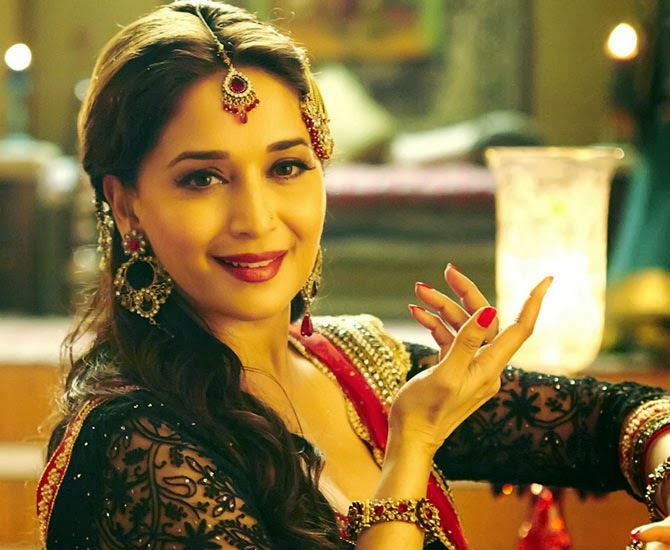 Her Nawabi style is poetry on the screen and perfect for the mood of Dedh Ishqiya.